There is little doubt that current state of human civilization is out of balance with nature. Industrialization has wreaked untold havoc on the environment, destroying ecosystems as a matter of course, all in the name of profit and control. The emission of carbon dioxide into the air has over the past 20 years has been all be criminalized by the priesthood of science. Advertisements indoctrinate the masses into the new age belief that humanity is polluting the environment to such an extent that it is catastrophically changing the climate. While pandemic pollution of the environment can't be ignored, the notion of man-made climate change is little more than a modern day myth, promulgated by a short-sighted scientific community and a despotic ruling elite. The recent Climate Change Conference in Paris sponsored by the United Nations, is receiving an enormous amount of media coverage, with talking heads on news outlets such as CNN and Fox news painting the picture that man-made climate change is an unquestionable reality. 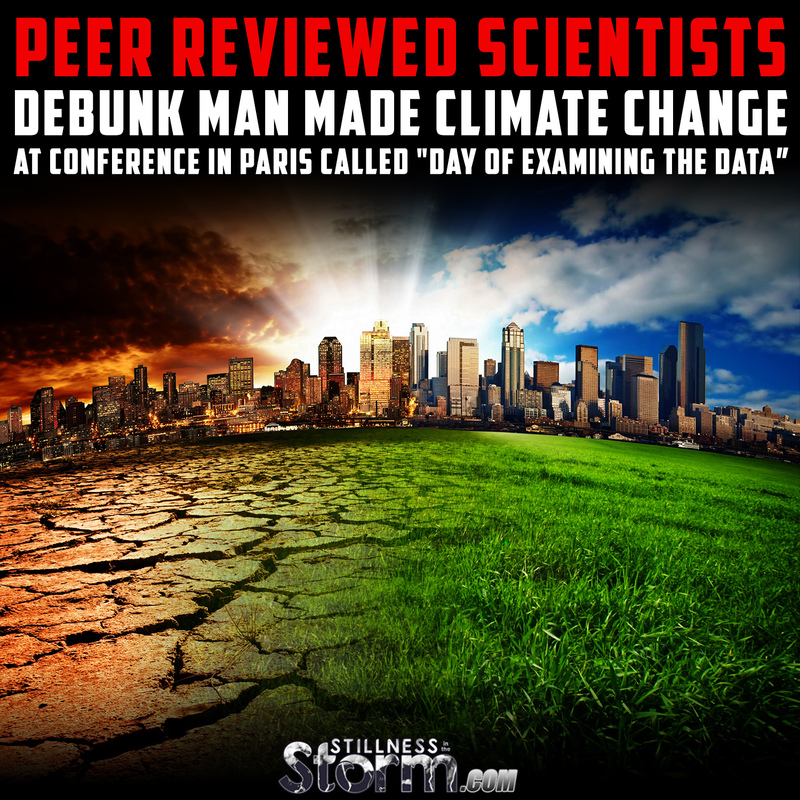 While globalist leaders plotted to further their war on CO2 and human life at the UN conference, The Committee for a Constructive Tomorrow (CFACT) and The Heartland Institute, an esteemed panel of peer reviewed scientists met in Paris on December 7th to present evidence that the theory of man-made climate change is implausible and unsupported by the full body of evidence available. The day-long program – called the “Day of Examining the Data” – will be held on Monday, December 7 in the San Francisco Room at the Hotel California, 16 Rue de Berri, 75008 Paris, France. The program begins with a press conference at 9:00 a.m., followed by panel presentations and a keynote luncheon address. Presenters will make the compelling case that an objective examination of the latest climate science shows humans are not causing a global warming crisis. The event is open to the public. Credentialed media should RSVP by contacting Heartland Institute Director of Communications Jim Lakely at jlakely@heartland.org or 312/731-9364. The presentations of science and policy will be followed by the global “red carpet” premiere of the CFACT documentary Climate Hustle at 7:30 p.m. at Cinema du Pantheon, 13 Rue Victor Cousin, 75005 Paris. S. Fred Singer, Ph.D., a physicist, is president of the Science and Environmental Policy Project and founder of the Nongovernmental International Panel on Climate Change (NIPCC). Read his full bio at this link. Willie Soon, Ph.D., is an astrophysicist and geoscientist based in Cambridge, Massachusetts. He is author ofThe Maunder Minimum and the Variable Sun-Earth Connection, as well as many articles published in peer-reviewed journals on the sun’s influence on climate. Read his full bio at this link. Robert M. Carter, Ph.D., a paleogeologist, is emeritus fellow of the Institute of Public Affairs in Australia and author of Climate Change: The Counter Consensus (London: Stacey International, 2010). Read his full bio at this link. Christopher Essex, Ph.D., is a professor of applied mathematics at the University of Western Ontario and a former director of its program in theoretical physics. He is coauthor, with Ross McKitrick, of Taken by Storm. Read his full bio at this link. The global press is calling COP-21 the last chance to convince the world’s governments to “solve” the global warming crisis. 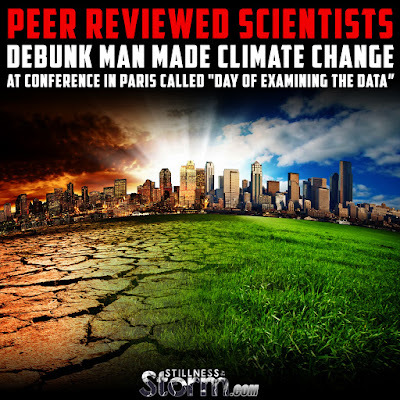 The contingent of climate realists – led by Heartland and CFACT – will be there to prove with globally accepted scientific data that there is no human-caused global warming crisis to solve. For background on these arguments, watch presentations by some 200 scientists and policy experts at Heartland’s 10 International Conferences on Climate Change. Those who prefer to read can review the four volumes in the Climate Change Reconsidered series, produced by the Nongovernmental International Panel on Climate Change (NIPCC) and published by The Heartland Institute. Once an honest review of the data has been done, it is easy to see how the present state of climate on Earth is most likely a product of natural cycles. Additionally, the entire solar system has been experiencing planetary climate change, suggesting that solar activity is most likely the primary cause of changing weather patterns. Finally, the advent of Geoengineering or Solar Radiation Management is a clandestine effort to alter natural weather patterns, amongst other things, which presently dumps countless tons of material into the atmosphere on a daily basis. Dane Wigington, a researcher, claims that the effects of what is commonly known as chemtrailing have had a huge impact on the Earth's ecosystem and climate. According to Wigington, the problem of destabilization is much worse than what even the alarmist IPCC scientists claim. In my view, the primary cause of climate change is solar, and relates to a natural process of changed energy states as the solar system moves through the galactic disk. According to the research, the solar system will continue to absorb energy from these more active regions of the galaxy until a type of quantum leap in solar activity occurs, which will profoundly affect life on Earth and in the solar system. Taking all the data into consideration, it appears that the ruling elite are attempting to prevent this shift in energy from affecting the Earth, by spraying compounds that reflect or disrupt incoming energies. But as a result, the Earth is essentially being terraformed by the nanotechnology and compounds used in the Solar Radiation Management effort. But the research goes much further than that, suggesting geoengineering is a multi-pronged agenda with many different possible applications. Related Chemtrails creating Cyber Humans? But there is hope. These nefarious plans can only continue on their course if we acquiesce via our inaction. Spreading awareness and developing a personal understanding of these realities will help us work together to end this madness and restore the Earth back to health. It is my view, the role of our species is to act as custodians to the Earth, to use her resources wisely and for the benefit of all life. For humanity is the only species that we know of empowered with a mind capable of understanding the world, providing the basis for ethical and responsible cooperation with the environment.